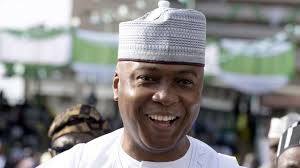 The Senate President and Peoples Democratic Party (PDP), Presidential aspirant, Bukola Saraki has declared that Nigerians made a mistake by voting President Muhammadu Buhari in 2015. He also said insisted that President Muhammadu Buhari does not understand governance and was not prepared for governance of the country when he was elected in over three years ago. Saraki made the claims while addressing Oyo state delegates and members of the party ahead of the national convention of the PDP at the state secretariat of the party located at Molete, Ibadan. The former Governor of Kwara State who said that Nigerians made a mistake by voting Buhari in 2015 added that Nigeria needs a "digital President". Saraki who came in the company of Captain Idris Wada, Senator Abiodun Olujinmi, Dr. Doyin Okupe to Ibadan, Senator Rafiu Ibrahim and Hon. Muhammed Wakil, declared that the incumbent President Muhammadu Buhari of the ruling All Progressives Congress (APC) "does not understand governance". He noted that the mistake Nigerians have made over the years was to elect people into positions of authority based on sentiments. He specifically maintained that Nigeria needed a digital President who can relate well with Presidents of other countries. Saraki while speaking further declared that he is the most capable for the work among the PDP Presidential aspirants, urging the Oyo state delegates to support his aspiration. He said, "The major mistake we are making is that we vote people who cannot do it. All other countries, they look for the best candidates. If you look at other aspirants, you will see that I can do IG better than all of them. "If you have observed, you will discover that Presidents of other counties who have visited Nigeria in recent time did not sleep in the country. They will just come for two or few hours and go back". Saraki insisted that having worked with the President for over three years, he has discovered that the Buhari does not understand governance.